Ansar City showroom is established in April 2006 with a new concept in Building Material Business. 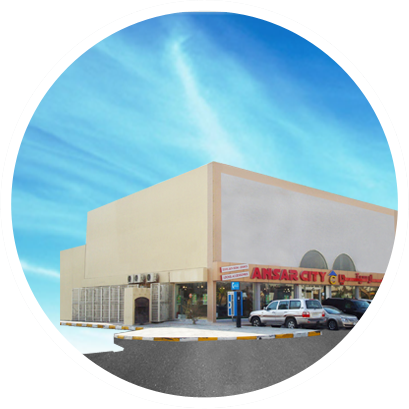 Ansar City Showroom strategically located at Salwa Road near the Decoration Roundabout in Doha, Qatar. You will find all kinds of your building material needs under one roof in an area more than 2500 square meters. We are blessed to contribute our part in association with most of the leading construction companies in the state of Qatar to build the big projects like towers, hotels, residential complexes and many other ventures. You can find the gallery of Ansar City with the unique collections of Ceramics and Porcelain Tiles in attractive colors and sizes which suites you. We have a wide range of granite marbles from China, Turkey and Spain. We have wide varieties of beautiful and decorative carpet tiles and ceramic porcelain designs. The collections have been developed to suit your own individual style and are available in wide range of models, colors and styles. A special section of wooden door and locks in attractive colors and in different sizes plus the quality doors made in steel and aluminum are also available. We also have the safe deposit boxes made from iron to save your important documents and precious items. A special section for all kinds of interior lighting, crystal chandeliers in multiple sizes and designs of which works with remote control system also available here at Ansar City, Doha, Qatar. We also have external lighting for gardens and walkways. It exclusively suites villas, palaces, residential complexes and offices. We are also having electrical switches and video phones with cameras. We offer multiple verities of bathroom sets in different colors including basic white and others. We also have the bathtubs, showers baths and Jacuzzis in different designs. We also offer plenty of models of glass sinks in different colors. A special section of bathroom and kitchens accessories, where we offer you the fitness types of mixers made in chrome and elegant in look. We have different set of mirrors and glass cabinets for the bathrooms.